Multi-billion dollar infrastructure projects generally aren’t built without an appearance of urgency. On Wednesday, the Brown Administration visited the high-tech capital of California to make that case for its $24.54 billion plan for the Sacramento-San Joaquin Delta. "Silicon Valley relies overwhelmingly on Delta water." 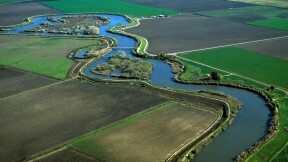 To meet those water needs, state officials are proposing two 35-mile water tunnels in the Delta that would connect to the state’s current water system, running hundreds of miles south to the Central Valley and Southern California. The water supply for 25 million Californians is currently pumped out of the Delta by aging infrastructure at its southern edge. Concerns over crashing salmon and Delta smelt populations have slowed the pumping in recent years. State officials are also making the case that a major earthquake could shut the system down. The cost of building and implementing the Bay Delta Conservation Plan, $24.54 billion, jumped by more than a billion dollars from previous estimates. Construction costs add up to $19.7 billion; the rest goes to operation over the lifetime of the project. “When you consider the current trends in the Delta, I think the real question is can we afford not to implement the Bay Delta Conservation Plan,” said Department of Water Resources director Mark Cowin. 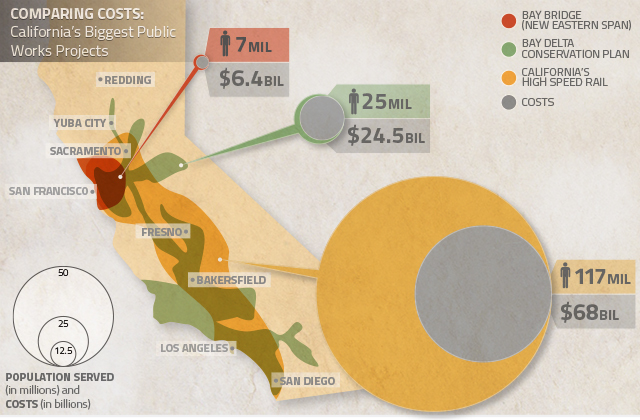 Water districts and agencies would pay for construction of the tunnels, topping $14 billion. The Santa Clara Valley Water District estimates its customers would pay an added $60 a year to cover the district’s share. How much water the project will provide for water districts is still an open question. Federal and state wildlife agencies released concerns that the tunnels would remove too much water from the ecosystem, harming endangered fish. The plan also includes more than $4 billion in habitat restoration, designed to help bring back the Delta’s crashing ecosystem. Officials are planning on using funding from the water bond on the 2014 ballot, as well as $1.9 billion from a second water bond sometime in the future. Critics of the plan say the administration has shied away from doing a true cost-benefit analysis of the plan. The state says water agencies paying for the project will see a net benefit of $5 billion. “It’s funny that Govenor Brown, the biggest proponent of the tunnels, said it’s time for California to live within its means because this would do exactly the opposite,” said Adam Scow of Food & Water Watch. In today’s dollars, California spent about $18 billion on the original State Water Project, a network of dams, pumps and aqueducts that broke ground in 1957. “The question for the current tunnel proposal is whether factoring in water reliability and various other benefits, is that going to be enough to make it worth the price?” she said. State officials are expected to release another full draft of the plan in October, with a public comment period to follow.